An island of enchanting contrasts, Aruba is blessed with turquoise waters, radiant beaches and prevailing trade winds ensuring a near perfect climate year-round. Nestled in the Southern Caribbean, Aruba covers an area that is blessed with miles of white-sand coastline, a booming city-life in Oranjestad and a variety of wildlife within the Arikok National Park, marking it as the perfect spot for a sunny Caribbean getaway. 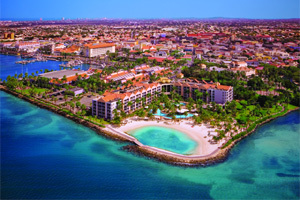 Known for clear, cloud-free days, exotic cuisine and a vibrant history, Aruba offers a fun-filled vacation for guests of any age. 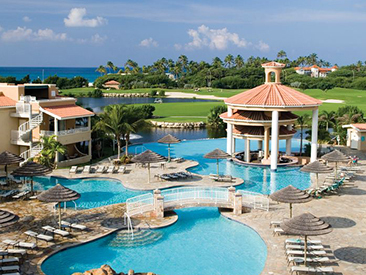 You'll find beautiful hidden beaches, windsurfers gliding across the waves, dazzling casino action, a championship golf course and irresistible shopping in the charming capital of Oranjestad; all the ingredients for a perfect island escape! 5 Dinners - or - 7 Dinners - or - 5 Breakfasts or Lunches + 4 Dinners. See the WELCOME tab of participating resorts for complete details. 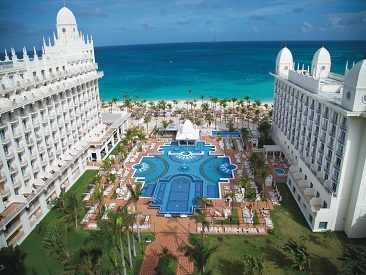 Offering the best in luxury all-inclusive accommodations, facilities and service, the upscale, beachfront Riu Palace Aruba is the perfect resort destination for every age and every occasion. This AAA 4-Diamond Award-winning resort complex offers both the hip, trendy Renaissance Marina Hotel for adults only (18+) and the all-suite Renaissance Ocean Suites beachfront resort, perfect for families. Plus a private island and two casinos! An "Escape Inclusive Plan" is available. Resort facilities are virtually endless and include an air-conditioned clubhouse for kids 5-12, the elegant Crystal Casino and the adjacent casual Seaport Casino, a theater, indoor and outdoor shopping areas, movie theater and more! An "Escape Inclusive Plan" is available. Located on beautiful Palm Beach, this family-friendly AAA Four Diamond award-winning, high-rise resort features lavishly appointed guestrooms and suites, four restaurants, three lounges, the luxurious Eforea™ Spa, a 16,000 sq. ft. on-site casino and two zero-entry, free-form pools. 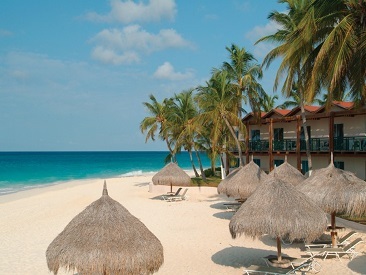 Located on the beautiful Palm Beach, Aruba, this exclusive, adults-only hotel entices guests with a stretch of beautiful white sand beach, an array of amenities, and delectable meals, to give guests the vacation experience they deserve. 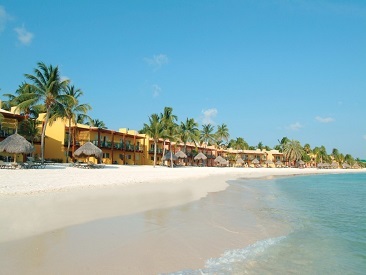 The fun never stops at this affordable, all-inclusive resort where families, couples and friends will find a relaxed and friendly atmosphere with tons of activities and water sports! 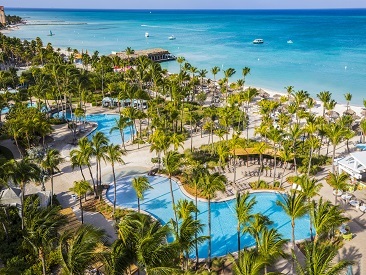 The Barcelo Aruba is an all-inclusive, family-friendly resort located on the pristine, white sand beaches of Aruba, just minutes from Oranjestad. Guests of all ages will enjoy lying on the beautiful Palm Beach, taking local excursions to natural pools or deep sea fishing or hitting the water for a kayaking or sailing session. Enjoy a VIP Service experience with expansive accommodations, exquisite cuisine from international dining selections and endless activities for adults and kids. Upgrade to Royal Level and indulge in personal concierge service, private check-in & check-out lounge, room service and elevated room amenities. 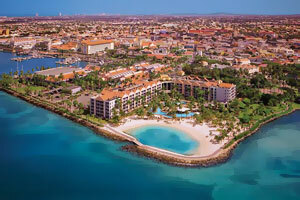 Divi Aruba All Inclusive Villas boasts comfortable rooms that sit on white-sand beaches in a beautiful, tropical paradise. Whether your room faces the turquoise ocean waters or the bright putting greens, there is always a breathtaking view to be found. 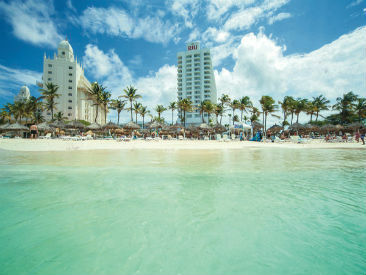 This value-packed beachfront all-inclusive resort boasts Aruban relaxation and fun at its best. 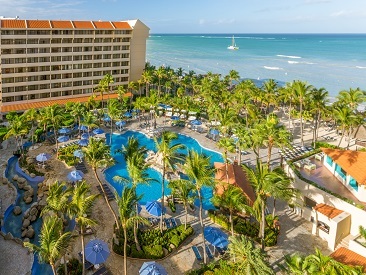 Families and couples will enjoy the best of both worlds with share privileges at adjacent sister resort Tamarijn Aruba All Inclusive.